Dude... have not listened to this 7" in years. It is sitting in my collection. Thanks for the rip. They recorded another demo in '95 and were on a couple of compilations. I know I have a demo somewhere with songs "folded","low-cut", and "next-to-you" (blondie cover) ... If I find it... i can make the songs available . holy crap- thank you!! would love to hear those 2 demos if they are ever found. 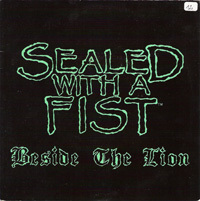 Thanks for posting the 7", its nice to see people remember S.W.A.F. I don't have a turntable, so the mp3s are nice to have! There are other recordings of S.W.A.F, it will just be a miracle to find them. Ray C. took over vocals and Mike M. played guitar on them.